2 PETER 3:10 KJV "But the day of the Lord will come as a thief in the night; in the which the heavens shall pass away with..."
7But the heavens and the earth, which are now, by the same word are kept in store, reserved unto fire against the day of judgment and perdition of ungodly men. 8But, beloved, be not ignorant of this one thing, that one day is with the Lord as a thousand years, and a thousand years as one day. 9The Lord is not slack concerning his promise, as some men count slackness; but is longsuffering to us-ward, not willing that any should perish, but that all should come to repentance. 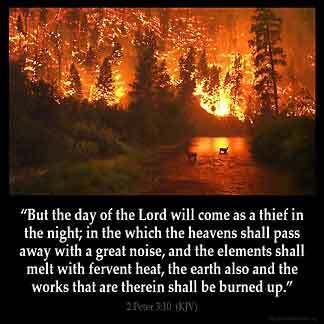 10But the day of the Lord will come as a thief in the night; in the which the heavens shall pass away with a great noise, and the elements shall melt with fervent heat, the earth also and the works that are therein shall be burned up. 11Seeing then that all these things shall be dissolved, what manner of persons ought ye to be in all holy conversation and godliness, 12Looking for and hasting unto the coming of the day of God, wherein the heavens being on fire shall be dissolved, and the elements shall melt with fervent heat? 13Nevertheless we, according to his promise, look for new heavens and a new earth, wherein dwelleth righteousness. But the day of the Lord wil come as a thiefe in the night, in the which the heauens shall passe away with a great noise, and the Elements shall melt with feruent heate, the earth also and the works that are therin shalbe burnt vp. For the dai of the Lord schal come as a theef, in which heuenes with greet bire schulen passe, and elementis schulen be dissoluyd bi heete, and the erthe, and alle the werkis that ben in it, schulen be brent. 3:10 But the day of the Lord will come as a thief - Suddenly, unexpectedly. In which the heavens shall pass away with a great noise - Surprisingly expressed by the very sound of the original word. The elements shall melt with fervent heat - The elements seem to mean, the sun, moon, and stars; not the four, commonly so called; for air and water cannot melt, and the earth is mentioned immediately after. The earth and all the works - Whether of nature or art. That are therein shall be burned up - And has not God already abundantly provided for this? 1. By the stores of subterranean fire which are so frequently bursting out at Aetna, Vesuvius, Hecla, and many other burning mountains. 2. By the ethereal (vulgarly called electrical) fire, diffused through the whole globe; which, if the secret chain that now binds it up were loosed, would immediately dissolve the whole frame of nature. 3. By comets, one of which, if it touch the earth in its course toward the sun, must needs strike it into that abyss of fire; if in its return from the sun, when it is heated, as a great man computes, two thousand times hotter than a red - hot cannonball, it must destroy all vegetables and animals long before their contact, and soon after burn it up. 2Pe 3:10 But the day of the Lord will come. This expression usually, but not always, refers to the second advent. Such is the meaning here. As a thief in the night. When people are not expecting it. Compare 1Th 5:2 Mt 24:43. In which the heavens shall pass away. See Lu 21:33. The elements shall melt. The material of which they are composed. The earth also and the works that are therein, shall be burnt up. The earth and all man's creations. That the world shall come to an end seems to be written in its very constitution. A slight change in the constitution of the atmosphere, or the decomposition of its water would wrap it in flame. Science finds the elements of final dissolution in the relations of the earth and sun. According to the ratio of increase in two centuries the would will not have resources to feed its population. In a few hundred years the coal resources of the world will fail. These and many other facts point to a necessary and inevitable change. The coming of the Lord is nearer than I think. The day of the Lord is coming when you think not. It is my prayer that I will have no attachments to this life that I have on the earth : to be able that when my Lord comes in the clouds of Glory that I will go up to meet Him in the air and so shall I ever be with the Lord !!!!! lets devote in persuing righteousness and love others ,for in doing so God will abide in us and us in Him,the bible says that he who loves the world the love of God is not Him,lets devote to loving our God,Jesus said whoever loves Him keeps His commandments.Peace be with you all!